One of the areas in the world where I work the most doing geological maps from satellite images or constructing balanced cross sections from our own maps or from seismic lines, wells, etc, is the Middle East (chiefly in the Kurdistan Region in Iraq, in Iran, in the whole of Turkey, Syria, Yemen...). 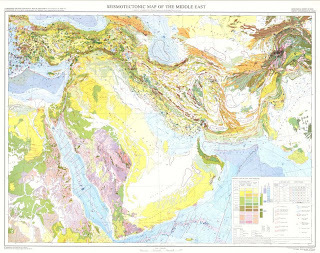 This morning, looking for a nice map to put up of my wall in the office, I found this link, which surely will be very useful to anyone looking for a small scale* geological map of Arabia and the Middle East. The link includes jpeg and pdf versions of tectonic, geological and seismic maps of the Middle East and Arabia. *Remember! 1:1.000.000 is a smaller scale than 1:25.000! I'd also like to use this!